If Estonia’s capital Tallinn has that instant wow factor, its Latvian neighbour Riga is a slow burner. Arriving for a one night break, I did what most tourists do and immediately headed for the old town, a charming warren of medieval streets which are great for pottering around and soaking in the fine buildings, such as the House of the Blackheads, The Three Brothers, and St Peter’s Church. It’s a compact area and easy to explore in a short time. 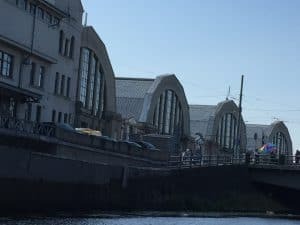 However, there’s much, much more to Riga than this obvious tourist draw and you really need to venture further afield to appreciate the city’s charms. As I was keen to see as much as possible, I decided to take to the water and booked one of the one hour boat trips on offer. The best way to experience one of these trips is to head for the Laima Clock on the edge of Baslejkalna Park; you can’t miss it – the grand clock stands in the middle of a wide boulevard with its brown blocks and letters spelling out its brand. Built in the 1920s, it’s clearly an advertisement for Latvia’s Laima chocolate, the nation’s biggest confectioner, but now serves as a popular meeting place for locals. 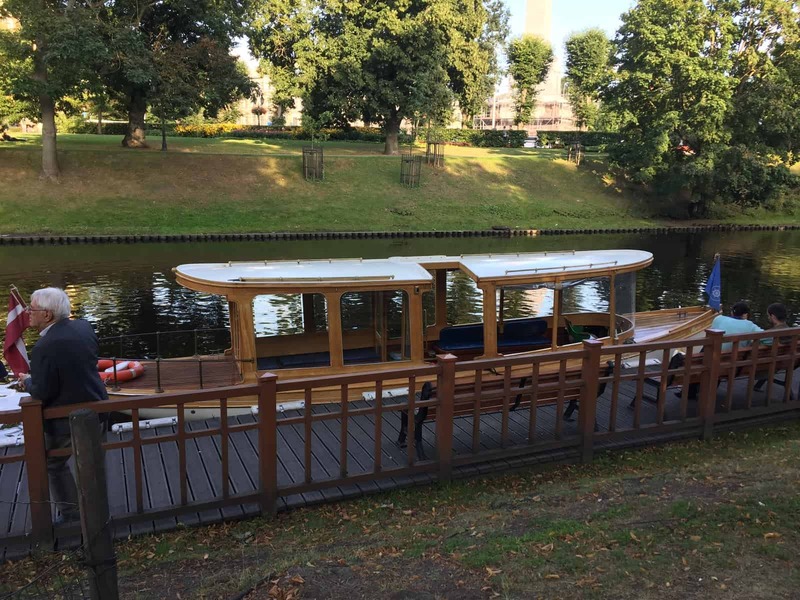 On entering the park, turn either left or right and walk along the side of the city canal; you’ll soon come across several landing places where small wooden boats are moored up, waiting to welcome you on board. I took mine from the landing post near the pretty wrought iron bridge, which is romantically adorned with love locks; the crossing straddles a tiny river with ducks bobbing up and down and leads you to Bastion Hill, a small fort-like structure built on a slight incline (its name makes it sound rather grander than it is). A short stroll away was the start of my trip. It was a slow start as the boat wound through a peaceful waterway where the water is calm and water lilies flank the sides; immediately above you, you’ll see the Freedom Monument, a striking obelisk that, at over 40 metres tall, is not only visually impressive (note the lady holding the trio of stars at the top), but also has historical significance. 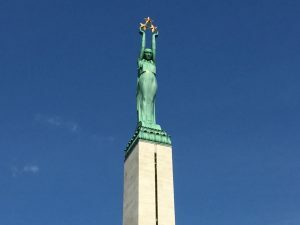 It was erected to honour those who lost their lives in the Latvian War of Independence from 1918 to 1920 and is a symbol of the country’s independence. On the other side of the waterway you’ll see the Latvian National Opera House, an imposing building bordered by well-tended colourful flower gardens and an ornate fountain; both opera and ballet are performed here and it would no doubt be a lovely place for a romantic evening out. 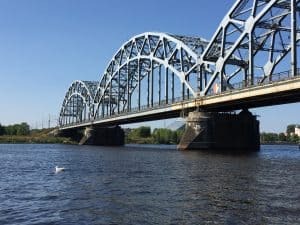 The boat continues its watery journey past grassy slopes and beneath a succession of old bridges, before gliding slowly past Central Riga. From your vantage point on the water, you can see the five distinctive buildings that comprise the central market. Once World War I Zeppelin hangars, the structures were later converted to become a market from 1930. At this point, the boat merges with the River Daugava; it’s surprisingly wide and choppy after the calm and serenity of the canal. 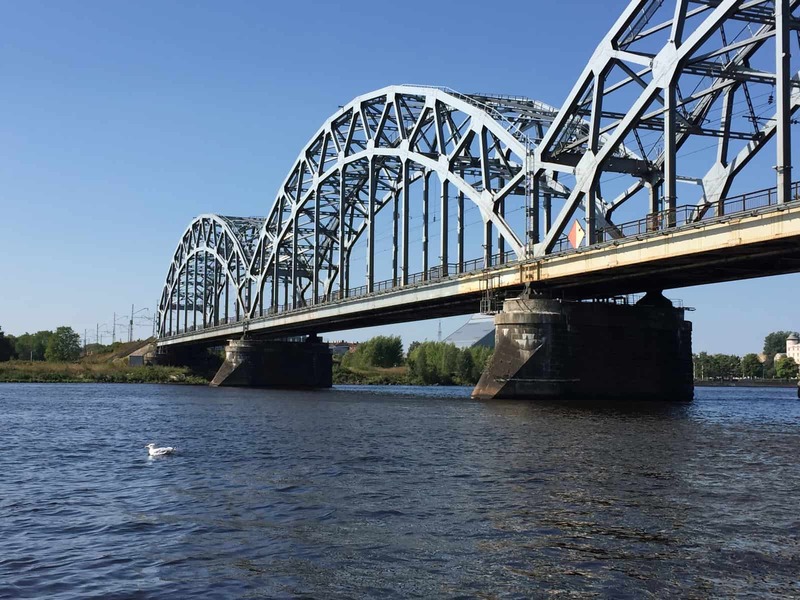 Riga is the final stage in the river’s 1,000km journey which starts in Russia and flows through Belarus. Huge transport bridges span the river, connecting the different parts of the city; from here you are afforded a spectacular view of the old town. On one side of the boat you can see Riga Castle, home of the Latvian President, and a remarkably modest building (on another occasion I managed to walk past it a couple times before realising its significance); this contrasts with the view in the opposite direction – huge modern buildings and industrial sites with commercial ferries chugging up and down the river past them; cranes rise imposingly, mirroring those of the church steeples in the old town that also adorn the skyline. The boat then turns, passes the yacht club with its expensive boats moored up, and back into the canal. You’re now moving past Kronvalda Park and the large fountain that ejects huge spurts of water; it’s trajectory is wide so be careful because you could get splashed (we did but it was welcomingly refreshing given the heat of the July day). Nestled in this park is a small Japanese pagoda. Across the bridges straddling the river is the district famed for its art nouveau architecture. You can’t see this from the boat but it’s worth walking the short distance afterwards to see the magnificent buildings lining the streets. 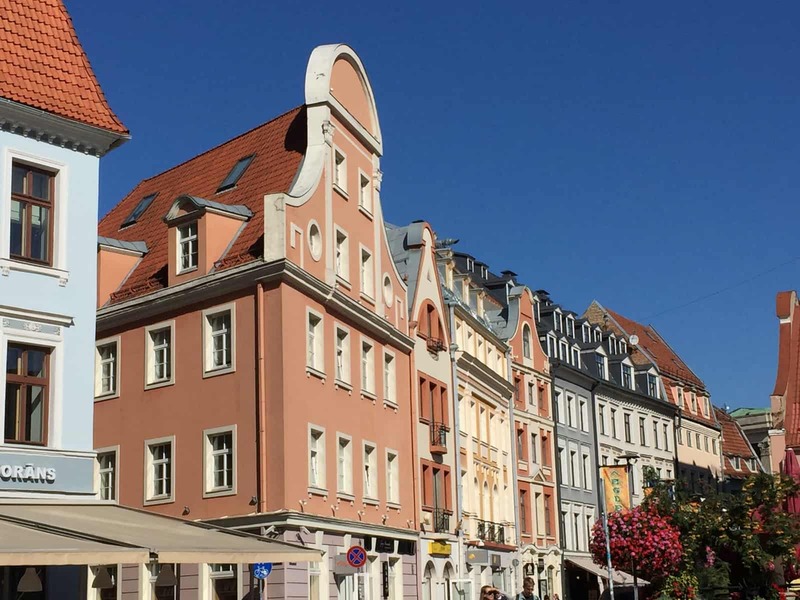 It is said that around a third of the buildings in Riga stem from this architectural era, which was popular in the late 1880s and early 1900s. Apparently, it is the largest collection of art nouveau buildings anywhere in the world (for those who want to learn more about this, there’s also a museum dedicated to this to visit). The trip is over in an hour, but I felt I’d managed to see a lot in a such a short time and the beauty of a trip like this is if you do it early on in your visit, you can pick out the places you most want to see and plan your trip around them. It also gives you the opportunity to see things you might not have managed in a short break (e.g. my time didn’t allow me to visit the market but it was interesting to see the old hangar buildings and learn what these started their life as). Riga is more than its old town; the more time you spend here, the more you discover and the more it grows on you. 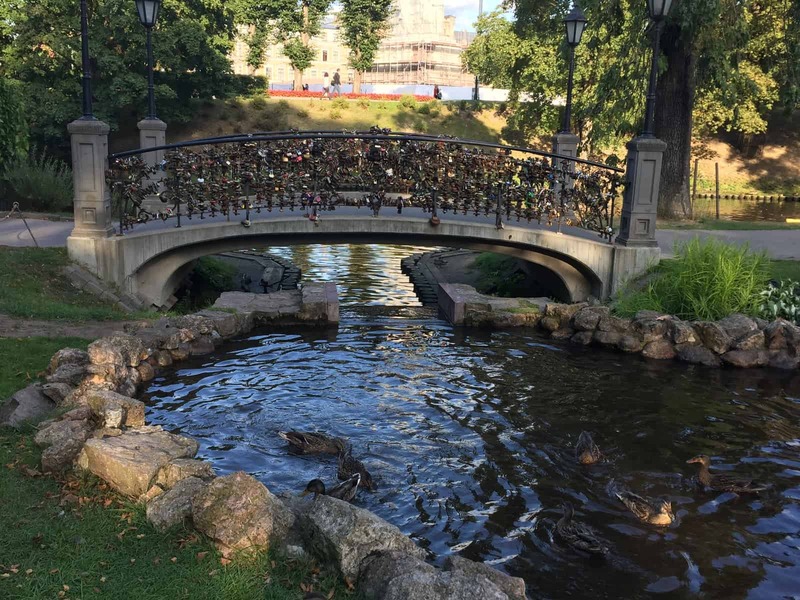 It’s true that it’s not as chocolate boxy as its northern neighbour Tallinn, but there’s so much to do here and it has a great vibe, with its canal and river and many beautiful parks to wander around. Riga is on my list for a return trip. Museums: There is a wealth of fascinating museums to visit here, including The Laima Chocolate Museum (good for children), the Latvian National Museum of Art, The Latvian Museum of Photography, The Riga Porcelain Museum, The Latvian War Museum and The Latvian People’s Front Museum and the Riga Ghetto and Latvian Holocaust Museum. Having visited the museum in the Viru Hotel in Tallinn, I particularly wanted to visit The Corner House, the headquarters of the KGB in Riga. It’s possible to visit the cells here but you really need to book in advance to guarantee a place on the tours which are popular and only run at certain times of the day (I didn’t and was disappointed). However, if you don’t manage to secure a place on a tour, there’s an interesting (and free) museum here that’s worth an hour of your time. 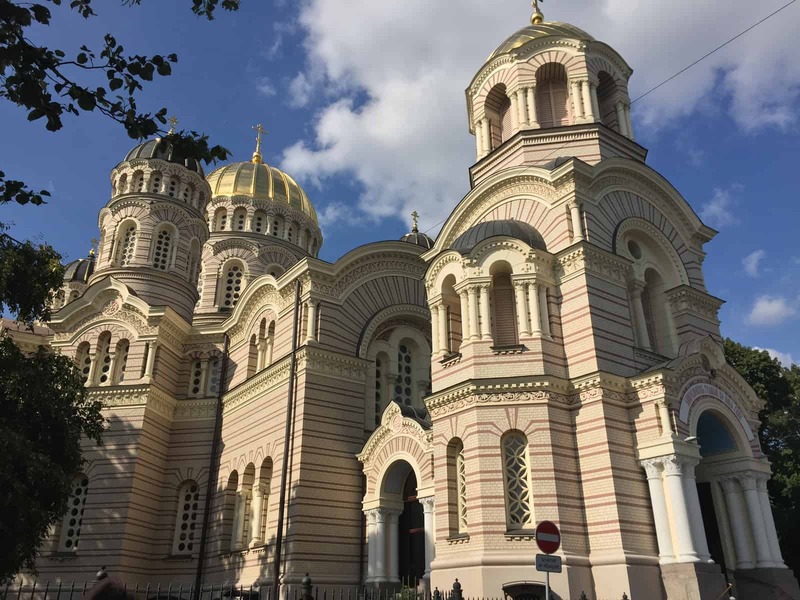 If you’re walking from the old town to the Corner House, you’ll pass the spectacular and eye-catching Riga Nativity Cathedral, an orthodox cathedral at the side of small grassy park. For cat lovers there is the Cat House, an apparently cheeky rebuff by the owner to being kicked out of the local Great Guild. 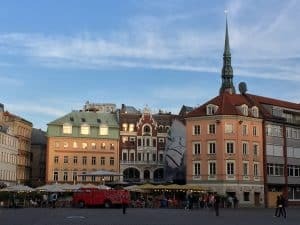 Getting here: You can fly to Riga from most European countries with Air Baltic or other carriers such as British Airways, Ryanair and Wizz Air. A taxi from the airport costs around 12-15 euros.